It doesn’t happen often in bodybuilding, but the 2018 Mr. Olympia brought a stunning upset that will change the sport for years. 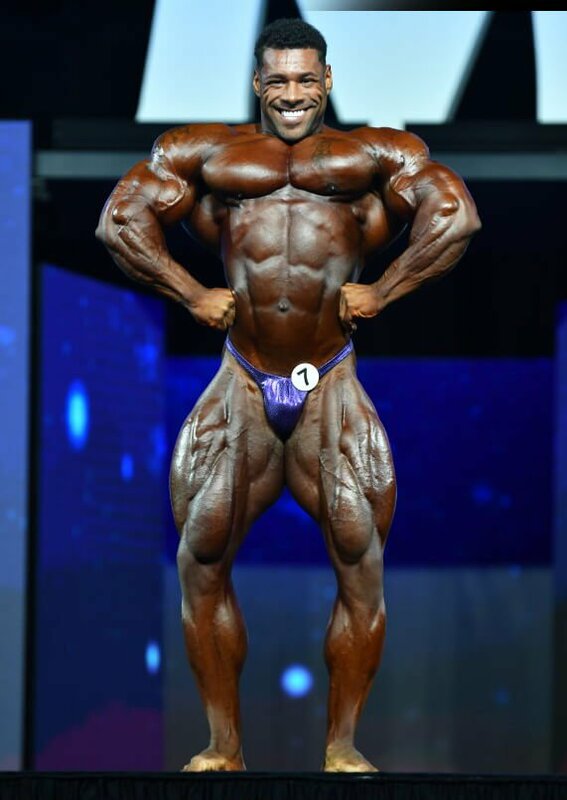 Shawn Rhoden defeated seven-time champ Phil Heath in a finish nobody saw coming. With terrific balance, dialed-in conditioning, and a polished stage presence, the 43-year-old Rhoden ruined Heath’s attempt to tie the all-time Olympia record of eight wins, shared by Lee Haney and Ronnie Coleman. In a repeat of last year, reigning champ and Old School Labs ambassador Breon Ansley held back a strong challenge from Chris Bumstead to repeat in the third rendition of the Classic Physique Olympia contest Friday night. Here’s a closer look at what went down this weekend. 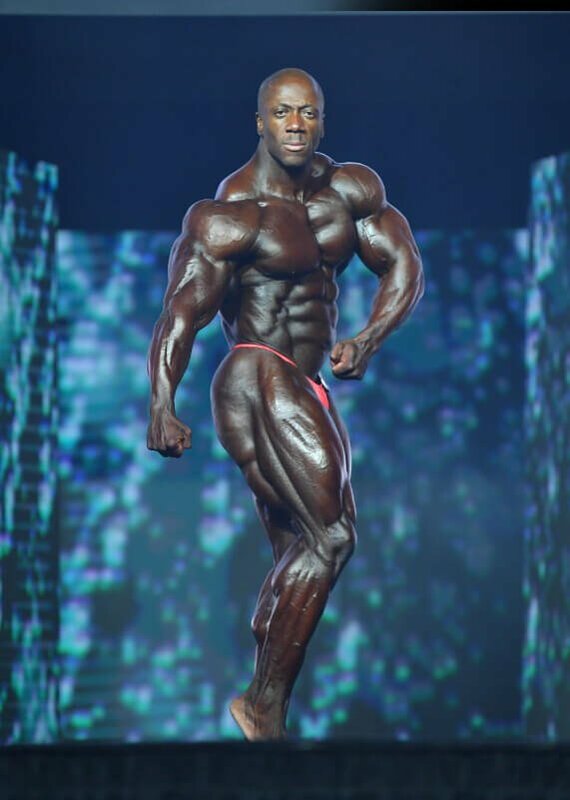 Current Olympia champ Breon Ansley took on the best lineup in Classic Division history to defend his title. Here’s a look at what went down. Ansley has established himself as the gold standard in Classic Physique, and his repeat of the Mr. Olympia 2018 title seals the deal. Not many bodybuilders are willing to jump into the Arnold Classic and the Mr. Olympia in the same year, but Breon Ansley isn’t your typical athlete. Every performance from Ansley is a master class in posing and poise. With superb symmetry, perfect balance, and conditioning that’s second to none, the 195-pound competitor owns the stage, but does so with class and showmanship. The aesthetic ideals the Los Angeles bodybuilder displays is a testament to the wisdom of creating the Classic division. Ansley does the sport proud, and his engaging personality will draw more converts to the division and the entire sport. Can he keep up his hot streak? We’ll see next year. Bumstead was terrific, and if not for Ansley’s brilliance, he would be toting a Mr. Olympia 2018 trophy around today. The Canadian took some extra time off this year to increase his advantage, and he definitely pushed Breon as he did last year, but once again he had to settle for runner-up. The 6’1″, 225-lb athlete is an entertaining performer, throwing out vacuum poses and other artful movements. The Canadian-born Bumstead clearly understands what Classic Physique is all about, and he gives fans something to cheer about. As he continues his battles with Ansley, Bumstead should continue to be a headliner in the category for many years to come. We can all look forward to him and Breon mixing it up in the next few big shows. Repeating his third place finish from last year as was George “Da Bull” Peterson, who once again brought plenty of beef to the stage. Da Bull is a power poser, but his 5’8”, 187-lb physique isn’t as balanced as the other top competitors. While his legs have begun to catch up to his upper-body, his muscle distribution isn’t where it needs to be, especially in his calves. Still, the sky’s the limit for the New York bodybuilder, who has the goods to take his career to the next level. Another Canada showed up in Las Vegas to storm the gates and did plenty of damage. “HP” came out of nowhere to battle his way into the top five. The 37-year-old Ano is a former open bodybuilding competitor who earned his pro card at the Canadian Nationals in 2013. A genetic marvel, HP played hockey growing up, then discovered he loved the weights. The weights loved him back. His epic upper body poses show Classic at its brawny best, showing that you can carry plenty of mass if you put in the right places. A little more leg sweep, and this veteran Canadian pro may threaten Breon’s reign. Rahbar continues to show up with a tremendous package, but always lacks a little something. This time he didn’t bring the dryness as he has in the past. One of the original stars of the Classic Physique category, Rahbar’s bid to take the Olympia title seems to be slipping as the years go on. After finishing runner-up in the first Classic Physique Olympia, he fell to fourth at the 2017 Olympia, and was forced to settle for fifth this time. While it looks like he’s going in the wrong direction, don’t count out the densely muscled competitor. He finished as runner-up to Ansley at the Arnold earlier this year, so he’s not going anywhere. He’s always a threat. Danny Hester Drops to 12th—Despite being 49 years old, Hester, the first ever Classic Olympia Champ, couldn’t break the to 10 for the first time in this contest. Still, the 5’6″, 175-lb Hester proved that you can have an amazing physique at any age. Next year he’ll qualify for his AARP card, yet he’ll still be good enough to compete on the biggest stages in the world. Hoffman Impresses. Germany’s David Hoffman was one newcomer who got a lot of attention, but couldn’t sway the judges to place him in the top 10. He finished 11th. Many thought he deserved better. Keep an eye on him. He could be a force to reckon with in the future. Wesley Vissers Disappoints. There were high hopes for the Netherlands bodybuilder, but he struggled in his Olympia debut, finishing completely out of the running, landing officially in 16th place in a tie with several others. It speaks to the competitiveness and volatility of this growing division that a talent like Vissers can be lost onstage. You really have to bring your A-game if you want to make an impression in the Classic Physique Olympia. Opera Goes Off-Tune. 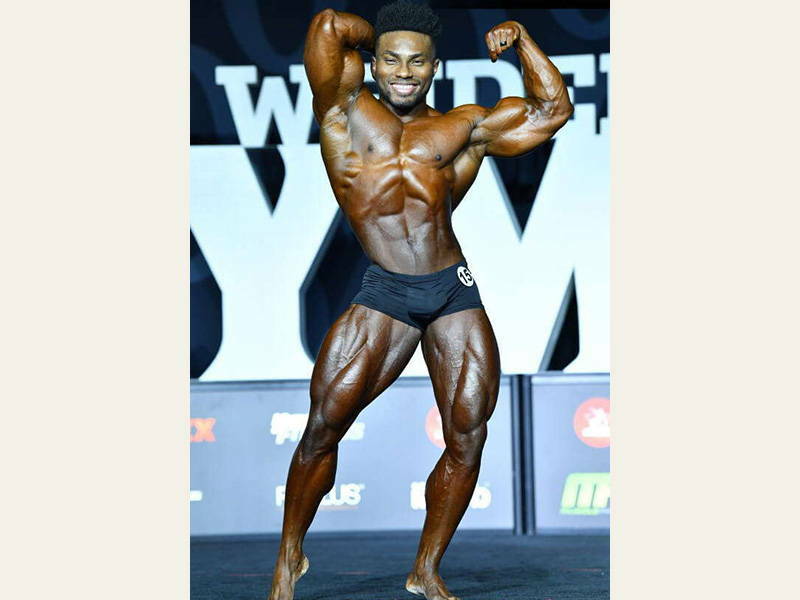 Highly touted newcomer Courage Opera was expected to score higher after finishing in third at this year’s Arnold Classic Physique contest, but he could manage no better than 10th place here. Like many competitors, he learned just how much the quality and pressure increases for the Olympia. 26! That’s how many competitors entered the Classic Physique Olympia this year, again proving that this division is growing in quantity and quality. 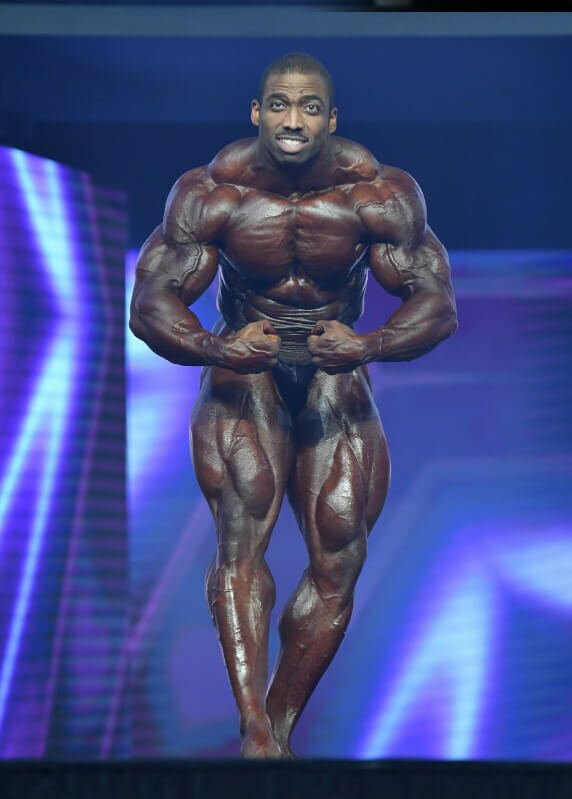 Shawn Rhoden’s victory in the main show seemed to benefit from the Classic ideal, indicating that standards for the sport are starting to conform to the Golden Era look. That’s good news for everybody in bodybuilding. The coronation didn’t happen. Phil “The Gift” Heath was expected to take his eighth Mr. Olympia title to tie the record shared by Ronnie Coleman and Lee Haney, but after seven Sandows, Heath’s night was ruined by the spectacular physique of Shawn Rhoden. Here’s how they placed at the Orleans Hotel on Saturday. Promise fulfilled. 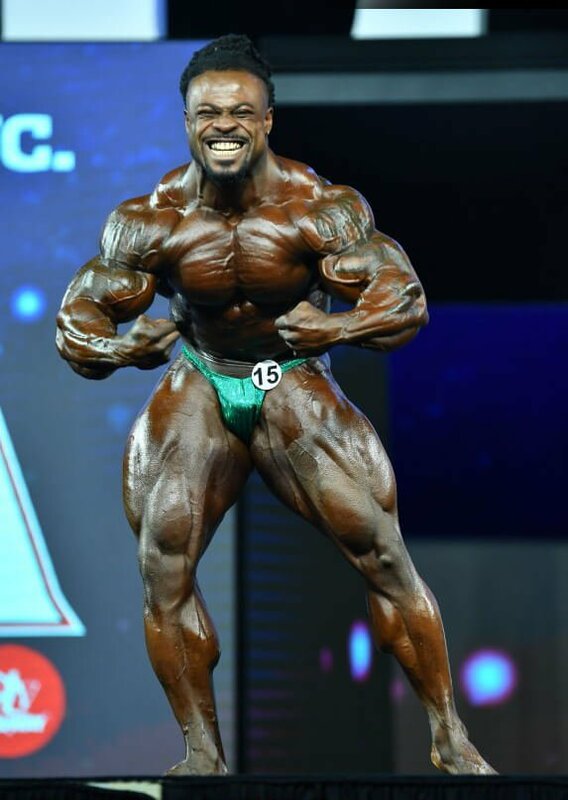 After placing runner-up to Phil Heath twice, Rhoden was considered one of the favorites to win the title for years, but dropped to fifth place last year. This time, Flexatron delivered. The Jamaican-born bodybuilder emerged with the best overall package in terms of balance, mass, conditioning, and aesthetic shape. One of the knocks against Phil Heath in recent years has been his midsection, which at times appears distended and overly thick. Rhoden, on the other hand, has a streamlined, perfectly contoured midsection, with a shoulder-to-waist ratio that wouldn’t be out of place in the Classic Physique division. 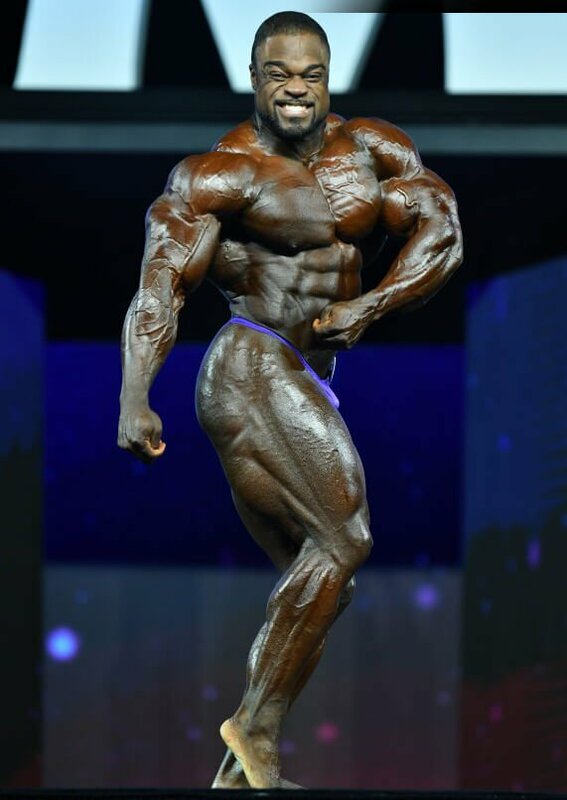 In the Mr. Olympia 2018 press conference on Thursday, Rhoden confirmed that he had criticized Heath’s front poses as lacking. Heath tersely responded, “Talk is cheap.” Then Rhoden backed it up. Flexatron’s appearance was much improved from his look last year. In the 2017 Olympia, Rhoden had sacrificed conditioning for added size, and he emerged onstage lacking the cuts and details that he usually displays. This year, he had it all. He also improved his back, which had been a lagging bodypart. And the crowd loved it! The sport benefits from change, especially when it rewards aestheticism over sheer bulk. This Mr. Olympia 2018 result has the potential to change professional bodybuilding in a big way for many years. As great as Heath has been over the years, this is a positive result for all concerned. Still, it was a shock to see Rhoden beat Heath. At 43 years old, Rhoden ties Chris Dickerson’s record as the oldest first-time winner of the Mr. Olympia. Rhoden has competed in every Olympia since 2011, and it seemed like his time had passed and he was destined to be a footnote in Olympia lore. But Flexatron pulled it off, and will go down in history as only the 14th man to win the coveted Sandow trophy. That and a $400,000 check earned for the victory made him a very happy man Saturday night. It seemed like a given that “The Gift” would tie Lee Haney’s and Ronnie Coleman’s record of eight straight Mr. Olympia titles. But it wasn’t meant to be. In a stunning decision, Heath fell to second place, causing shockwaves throughout the crowd. For seven years, Heath dominated, fighting off one great athlete after another. Last year, the reigning champ was pushed by Mamdouh “Big Ramy” Elssbiay, but in the end, Big Ramy didn’t have enough to dethrone Heath. Perhaps that close call affected Heath, who played the size game at the expense of a more conditioned look. He lacked the detail of years past, and his thick waist stuck out more than usual while standing next to Rhoden’s superior midsection. While Heath strode the stage with undeniable confidence, he couldn’t dim Rhoden’s shining example of aesthetic excellence. All great athletes face the music at some point in their career when a long-time foe finally gets the better of them. Either they come back stronger, or their decline begins. After the show, Heath released a video thanking his fans and vowing to come back. It should be said, he was not a sore loser. As one of the greatest bodybuilders of all time, The Gift should keep on giving. He just may break the Olympia record in the future, but the judges have served notice: shape and aesthetics means more now than ever. Big Roelly improved his conditioning from last year’s Olympia when he battled his way to a sixth place finish. After placing fourth at the Arnold Classic earlier this year, Winklaar proved he wasn’t done making improvements, and came in with a tighter package, including a more streamlined midsection. It was his highest placing in a Mr. Olympia yet. While Winklaar had to settle for third here, he did win the first-ever “People’s Champion” award given to the bodybuilder who earns the most votes from fans online. The Dutch champ with the giant arms always comes in huge and happy, and his wide smile and incredible proportions are a fan favorite. It’s great that he was rewarded for it. At 41 years old, he won’t have a lot of opportunities to win the Olympia, but after Rhoden’s upset, the field is now more wide open. His time may come. Before the contest, most bodybuilding experts believed Bonac had the best chance of beating Heath. After placing third in last year’s Olympia and winning the 2018 Arnold Classic in dominating fashion, Bonac seemed destined to do just that. But in the end, Bonac’s dense musculature didn’t attain the conditioning he needed to climb higher up the standings. The Conqueror’s performance may not have conquered, but he still proved he has the potential to take the whole enchilada in the future. At 36 years of age, Bonac can still make it to the mountain. With his massive arms and legs, he’ll always delight the fans. Once again on Saturday night, he delivered a worthy performance that riled up the crowd. He’ll be back. “The Prodigy” finished a lackluster eighth at last year’s Mr. Olympia, but this time he showed signs of fulfilling his promise. The 5’7”, 250-lb competitor added size to his legs to catch up to his huge upper body. His lats, delts, and arms are something to behold, and he impressed onlookers at a guest-posing in Hungary in early August. He’s added the muscle he needs to finish higher at the sport’s biggest contest, and he may very well be a future Mr. Olympia. As of now, he’s a tremendous talent who needs to match his peak with his mass on game day. Still, he should be happy with his top-five placing here. 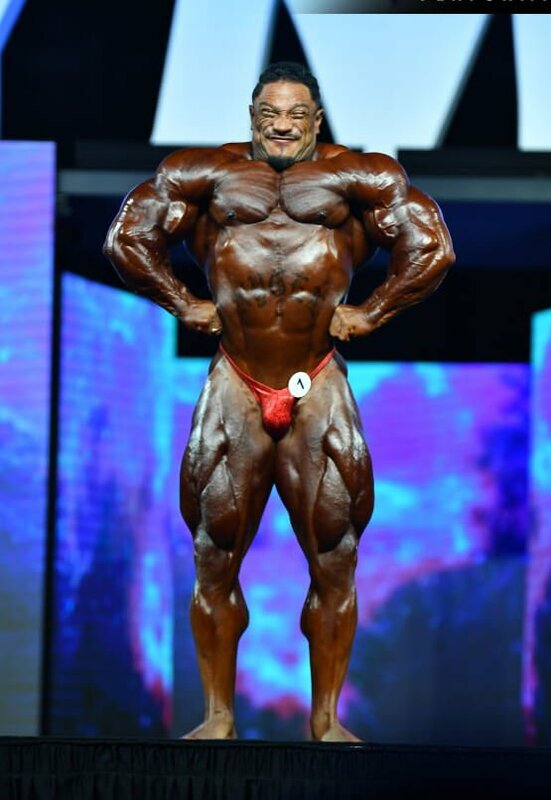 Mamdouh “Big Ramy” Elssbiay disappoints, apologizes to fans— This was supposed to be his year, but Big Ramy missed his conditioning and finished a disappointing sixth. Last year’s runner-up, Ramy is beloved by fans for his nearly 300 pounds of rippling mass, but the Egyptian bodybuilder lost his cuts and details, and without them has no chance against the likes of Rhoden, Heath, and Curry. After the show, Big Ramy apologized to fans via an Instagram post, saying, “I know most of you feel disappointed and angry and hate me. I’m sorry for that.” Then he vowed to fix the problem. While his fans definitely don’t hate him, Big Ramy will want to address what went wrong for the future. He still could be a Mr. Olympia in waiting. 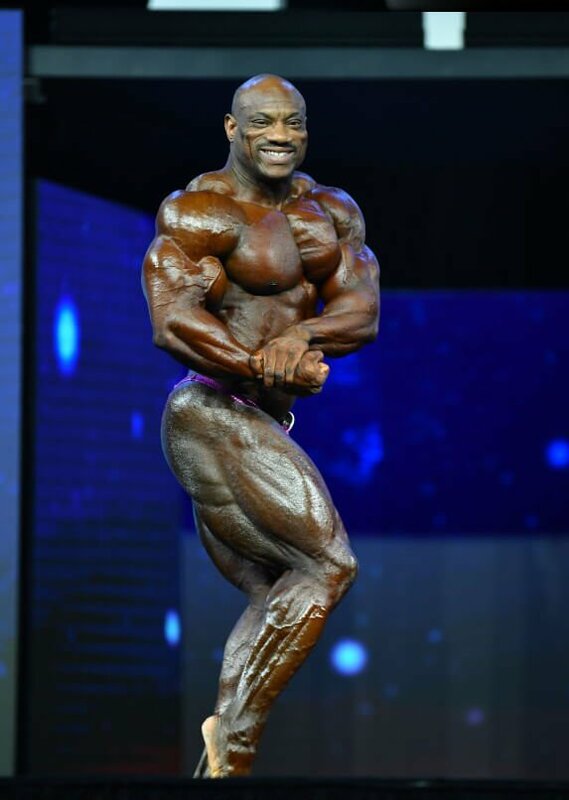 Dexter Jackson Drops Down—Already a legend in the sport, Dexter “The Blade” Jackson is another ageless wonder who continues to be a world-class talent onstage. While seventh place in the sport’s biggest show isn’t too shabby, The Blade has higher standards, and as a former Mr. Olympia (2008), his goal every September is the Sandow. Soon he will turn 49 years old, and Father Time catches up to all of us eventually. Will he continue to compete? He clearly loves the sport, so don’t expect a retirement anytime soon. But as all the great ones eventually find out, age takes a toll. McMillan and De Asha Don’t Move Up. Two competitors with the biggest potential seem stuck in quicksand: Cedric McMillan and Nathan de Asha. 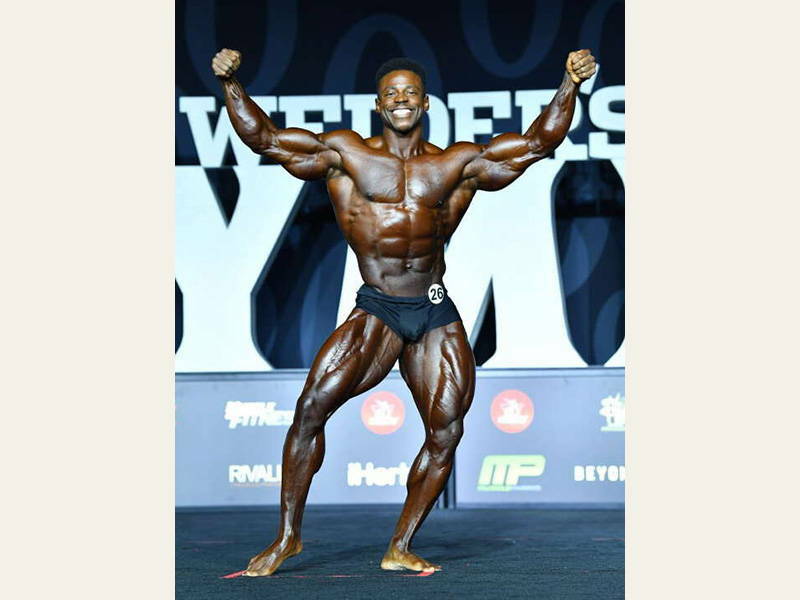 De Asha finished eighth for the second year in a row, and McMillan, a former Arnold Classic champ, finished ninth, an improvement of only one place after his 10th place showing at last year’s Mr. Olympia. He can do better. So what did you think of the placings? Did you watch the contests? Tell us what you think in the comments below.